The Newport show takes place Thursday, September 11 to Sunday, September 14. The fleet and product displays will span thirteen acres along the waterfront. “Newport for New Products”—which features U.S. sailboat and powerboat debuts—is how show organizers highlight what’s new and innovative for the coming season. Beyond looking at boats and gear, you can also use the show as a way to brush up on your skills or help a friend or family member gain more confidence on the water. The “At the Helm” program includes both sail and powerboat instruction with Confident Captain/Ocean Pros. And don’t forget to schedule some social time: be inside the show gates Saturday by 6 pm so you can attend the Cruisers Party hosted by Cruising Outpost. Volvo Ocean Race fever is taking root as Newport readies for this global race’s only North American stopover in May 2015. Stop at the Sail Newport booth to get the latest, don’t miss the “pep rally” at 4 pm Saturday, then start making plans to return to Rhode Island when the fleet is in town. And don’t forget to stop by the Oliver Hazard Perry booth to get the latest on this made-in-Rhode Island tall ship. If you’re planning to cruise to Newport for the show, make your plans early. The show’s fleet will use all the dock space at the Newport Yachting Center, Oldport Marine, and Bannister’s and Bowen’s wharves. But if you want dock space, there are plenty of other options. Marinas such as Goat Island Marina (401-849-5655), West Wind Marina (401-849-4300), Newport Yacht Club (401-846-9410), and Newport Harbor Hotel & Marina (401-847-9000) offer transient dockage. Moorings are on a first-come, first-serve basis. You can raise the harbormaster on Channel 16 or contact Oldport Marine Services (401-847-9109/VHF Channel 68) and Newport Mooring Service (401-846-7535). Ida Lewis Yacht Club (401-846-1969) offers reciprocal privileges to members of other yacht clubs, and the Oldport launch extends its hours during boat show weekend. If you want to stay farther away from the show traffic, book some dock space at Conanicut Marine Services (401-423-7157) in Jamestown. 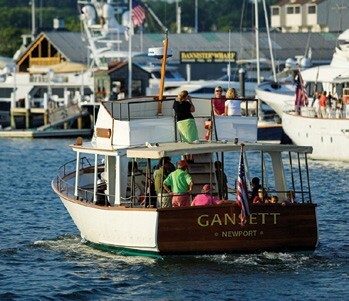 You’ll be within walking distance to great restaurants—such as Simpatico, Jamestown FiSH, and Slice of Heaven for breakfast and lunch—and the Jamestown-Newport Ferry will be your ride to the show. Spend a few days and you’ll find lots to do both inside and outside the show. If sailing onboard a 12 Meter is on your bucket list, contact 12 Meter Charters (1-800-820-1223) or America’s Cup Charters (401-849-5868). Both companies offer private charters for groups. You can also buy individual tickets for regularly scheduled sails, so plan to cap your day at the show with some sunset sailing on a Twelve. If you are in the mood for small-boat fun, head across the harbor to Sail Newport where you can charter J/22s or Rhodes 19s (401-849-8385). If you need a classic-boat fix, walk down Thames Street to the International Yacht Restoration School (IYRS). The 1885 schooner yacht Coronet is being restored on the campus, and you’ll find a Coronet exhibit at the Museum of Yachting, located inside the school’s Aquidneck Mill Building (iyrs.edu). When it comes to dining in Newport, there are ample choices close to the show. Start your day at one of the local breakfast haunts; try the Franklin Spa, or hang with locals and IYRS students at Gary’s Handy Lunch on Thames Street, or visit Belle’s Café and its backdrop of superyachts at the Newport Shipyard. For later in the day, you’ll find The Mooring, 22 Bowens Wine Bar & Grille, and the Smokehouse in the heart of the show. Other classic hangouts for sailors include the Clarke Cooke House and the Black Pearl, on Bannister’s Wharf, and Café Zelda, located a half-mile from the show on Thames Street. For more information about the Newport International Boat Show, visit newportboatshow.com. For more ideas on all the ways you can enjoy this area of Rhode Island, head to discovernewport.org.